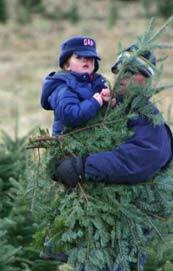 You can find a fragrant, fresh New Hampshire Christmas tree on retail lots throughout the Granite State. Some of these lots are run by tree growers themselves and others are garden centers, nurseries, service groups and general retail sites. A retail lot near you is an easy and convenient way to get your tree. Here's a handy shopping tip: buy your tree early in the season. You will get the best selection and the freshest tree. Trees are usually the freshest when they first arrive on the lot; pick one out early, take it home and properly care for it, and it will stay fresh for the entire season. Retail lots often offer the added convenience of one-stop shopping. You can get your tree, wreaths, poinsettias and other holiday products all at one. Call one of the retailers listed below to find a fresh, New Hampshire Christmas tree for your holiday.